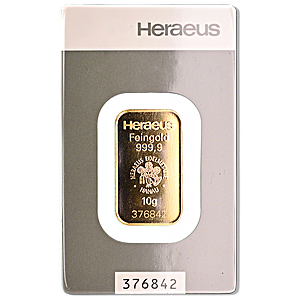 The Heraeus 10 gram minted gold bar is a highly-finished investment grade gold bar from Germany’s most famous precious metals refinery group. 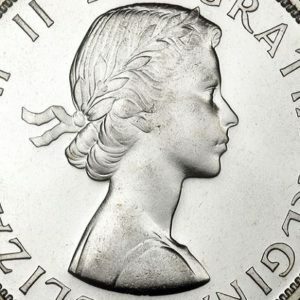 Heraeus is one of the world’s best-known producers of investment grade gold and silver bars, and its investment bars are highly respected throughout the precious metals world. 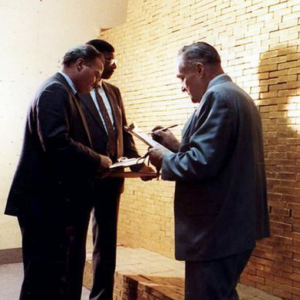 Each 10 gram gold bar has a gold purity of an extremely high 99.99. The obverse of each 10 gram gold bar is stamped with the with the bar’s gold fineness, its weight 10 grams, and the famous Heraeus refinery motif of hand with roses. Encircling the refinery motif are the words “Heraeus Edelmetalle – Hanau”. The Heraeus group has its headquarters in Hanau, Germany, which is located about 25 kilometres east of Frankfurt.